Signature Dark Energy Mark 1 Hi Hats 14"
PSTX Swiss Flanger Crash 14"
PSTX Swish Thin Crash 16"
"what more can I say about Paiste Cymbals! From the 2000’s and 2002’s on my first kit to the sound palette at my fingertips now there is not a musical situation I can’t cover. This gear just makes me grin every time I play." Ashley Higgins is a successful educator & performer. He began his career studying brass and woodwind instruments but quickly realized that his interest was in the ‘driver’s seat’ of a band. The devotion to the art of drumming began. By the time he was 14 he was working professionally with many bands and artists throughout South East Qld. 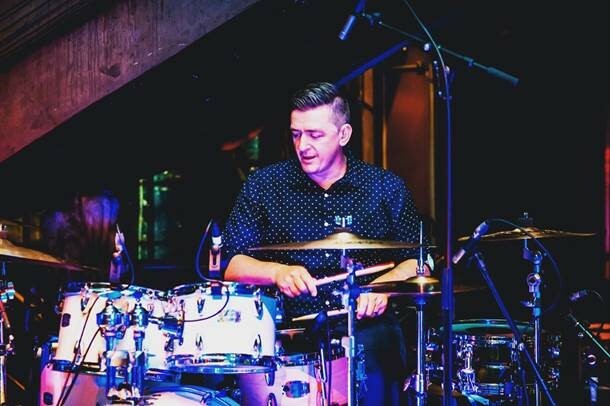 He is a graduate of the Queensland University of Technology holding a Bachelor of Arts in Jazz & Popular music as well as a Graduate Diploma of Education. It was during this time that he was not only in demand as a drummer but also as an educator. Ashley has been a Music Educator with Education QLD for over 16 years working at some of Brisbane’s most acclaimed music schools directing concert bands, orchestras, big bands & percussion ensembles. He has conducted workshops and professional development sessions for teachers and students and is the lead teacher at the Just Percussion Music School in Brisbane. Doug Parkinson, Melinda Schneider, Glory Days – The Boss Experience, Tom Sharah, SavVy, Elevation Live Band, The Oz Hornz, The Radio Club Band, The Baker Boys Band, All Brassed Up, Miss Mandy Swings, Rhonda Burchmore, Harvest Rain Theatre Company, The Brisbane Contemporary Jazz Orchestra, Queensland Pops Orchestra, Creative Generations – State Schools Onstage (Network 10) & The Lord Mayor’s Christmas Carols (Network’s 7, 9 & 10).